There’s no question that crooked teeth can hinder your oral health. It makes you more susceptible to gum disease, tooth decay, and makes it more difficult for you to enjoy your favorite foods. You’re smile will suffer and your teeth will only continue to grow in awkward directions. So next time you visit your dentist, consider Invisalign over traditional braces. With clear aligners, you’ll still be able to get the smile you want without all the gripes that come with braces. They offer a level of convenience and effectiveness that is incredibly hard to match. Traditional braces need to be worn for a minimum of 18 months before any kind of results can take place. In fact, many patients need to wear braces for longer than that. On average, adults can expect to have their braces between 18 months and 3 years. This make braces a very time-consuming and expensive process. Invisalign offers adults a much shorter time frame for results. Patients can expect to see straighter teeth in as little as 12 months. While this depends on the severity, the speed at which Invisalign begins working is substantially quicker than traditional braces. 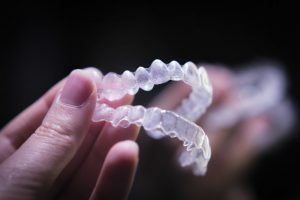 While we’re not questioning the effectiveness of traditional braces, we are stressing how effective Invisalign’s treatment is given the additional benefits they provide. While traditional braces may be effective at realigning teeth, Invisalign can also address many complex cases of crooked teeth. Thanks to SmartForce features and SmartTrack material in Invisalign, dentists can move your teeth more precisely than ever before. If there’s one thing you want in your realignment treatment, it’s the confidence that your teeth are changing into the smile you’ve always wanted. Getting used to traditional braces can be an arduous process. The additional hardware makes brushing more difficult. Eating your favorite foods may be impossible during treatment since they can easily get caught in the wiring or brackets in braces. This could lead to them becoming damaged and needing replacement. Clear aligners are easily removable, so you don’t have to change your brushing or eating habits just to get straight teeth. Furthermore, Invisalign’s SmartTrack material is designed to precisely fit the shape your teeth comfortably while still pushing them towards your desired look. Not only do teens get to maintain their image at a young age, Invisalign’s clear aligners come equipped with compliance indicators that fade from blue to clear. As they wear their clear aligners, they’ll be better able to measure how long they’ve worn them, keeping their realignment timeline on track. If you’re an adult trying to get straighter teeth, you’ll get to keep the professional image you already have. Traditional braces are typically associated with teens, so being able to straighten your teeth without your coworkers noticing is just a bonus. Don’t hesitate to get a straighter smile. Contact your orthodontist to learn more about Invisalign in Temple today! Dr. Fossum first attended the University of Texas at Austin before earning his dental degree from the University of Texas Dental Branch in Houston. His practice was named an Invisalign Preferred Provider in 2016, so you know you’re in good hands when it comes to clear aligner treatment. To learn more about his practice, contact him at (254) 778-3900 or visit his website.